There are two types of isometrics: yielding and overcoming; I use both, and both are great, but I find yielding more fun because there is a measurable load, and there is even a grading system. In this ebook, I share my favorite Yielding Isometric Exercises, which are especially good for the traveling man, because the practice requires virtually no equipment, and what few props you do need, you can find in any hotel, motel, or what-have-you. One of the advantages is that you know when you reached total fatigue in each muscle, because you simply can't hold yourself up anymore. For some, this is more incentive-producing. Who will benefit form the Yielding Isometric program? Anyone will benefit fromt this one: male, female, and anyone of any age or ability. Each of these exercises are easily modified, so that an Olympic champion--or your grandma--can equally get a great, result-producing workout, right where you are, without having to visit some craptastic hotel gym. This workout is intense and, like strong medicine, more does not mean better. I recommend taking at least 2-3 days off between these workouts. That doesn't mean inactivity, but not strength-training. These exercises can also be combined and adapted to any workout you are already using. Many of these exercises can be added to other programs you are already using. 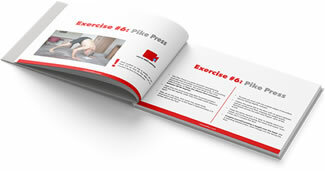 I've made video clips of each exercise, fully explaining the princples and bio-mechanics of each position in a booklet format with still images and written instructions and descriptions. No, this is not strictly a follow-along program. You should be able to complete the sequence on your own in 25-minutes. The partial video clips have been edited together to make a sequence that can be followed, but it is not originally designed as a follow-along video. Assuming you take 30-seconds rest between each exercise, we are talking a 25-minute workout. If you take longer rest, say a 30-minute workout, but this would be dawdling. Most people can get this routine done in 20-minutes, and I recommend keeping rest times minimal, so that you can reap the benefits of metabolic conditioning. How long will this workout last me? This is a system of training that few people know about or understand. You are paying for the principles of the workout -- and once you understand the principles, you can apply them to any specific exercise. It's like instead of giving the man a fish, I'm teaching a man to fish. In reality, I'm giving you a workout that you can apply to home, garage, hotel, vacation. This workout is both your travel companion, and your comfort at home. You can do it pretty much anywhere, anytime, any place, as you need very little space. This simple system is good value for years of training. There is one: if you have high-blood pressure, you must take great care with the breathing, that is, take great care to NOT hold the breath and build more pressure. I've had my fair share of dings from my years in combat martial arts (more than my fair share) and I don't want my workout adding to that. After 5 weeks of exclusively using Steve's Yielding Isometric program I have noticed a marked increase in my on-the-mat strength. I am unquestionably stronger through a larger range of motion, in all planes of movement, and I wake up with zero soreness or injury. This has helped me commit to actual martial arts training as I don't have compromised recovery. I feel like training in this fashion energizes me as opposed to the drained feeling that comes from heavy weight training. For athletes, I can't recommend Steve's Yielding Isometric training enough. Steve Maxwell is unlike any other fitness coach that I met or even heard about. He has a unique and original approach to fitness and health. His [yielding] isometric workouts have given me better results than anything I've done in the past. To be honest, I wouldn't even want to walk into a gym anymore, because I much rather do my training in an open area or in my garage with minimal equipment. It's ideal for travellers, or for anyone who doesn't want to spend time and money going to a gym. The workouts are designed in a way to keep you safe and injury free, and they won't just make you stronger physically, but also mentally. If you are planning to follow Steve's advice you are in for a treat. Steve's Yielding Iso Workout is a brilliant training routine that balances mental, strength and cardio demands. Do it like he directs, and you'll find it's all the challenge you need packed into 25 minutes. It's no joke. ...However, I very grateful for your assistance. Before using your [Yielding Isometrics] body weight strength training system, I had been training using mostly weights (strength training using mostly powerlifting movements) and, just recently, kettlebells. I had a lot of aches and pains training this way, but once I started using your system I really haven't the aches and pains I once had. Using your [Yielding Isometrics] training protocol has been a real eye opener in my training perspective as the workouts are brief, intense, and infrequent while training the whole body. Before using your methods I was skeptical about body weight training but my views have now changed. I have become significantly functionally stronger, while at the same time avoiding injury, and this has allowed me to perform at a higher level in my other physical activities. Your system is one that someone could use for a lifetime. I have been using Steve's yielding isometric body weight workout for a while now. This workout is proof that you can get into great shape and achieve fantastic results while reducing the stress and risk of injury to your body. Keep up the great work, Steve. When Coach Steve first sent me a list of yielding isometric training exercises to do for the first time, I was skeptical. "Only 90 seconds each? ", I said to myself. Wow, what a deception. With just 6 to 7 exercises, done in less than 20 minutes, my whole body felt the effects of this brutal but awesome training system. I am experiencing the benefits of the isometric training in my performances on the mat, my law enforcement career, and my overall health. I recommend everyone to challenge themselves with this training system. When I met Steve few years ago, I was intrigued with his knowledge and creativity about training. I never thought that a workout can be so challenging, interesting, effective, and simple at the same time; it was like discovering a whole new world. Before I went under Steve's training program, I lifted weights for many years and I always liked strength training. After he sent me the workout with just few exercises, and instructions to do just one rep I thought there is some mistake. Then, I tried that workout and realized there is no mistake; it was the hardest and shortest workout I ever did. As I'm pretty busy with my job, I don't have too much time for walking around the gym every day and doing bunch of sets of different exercises. This workout saves your time, makes you stronger and healthier at the same time. And it's not just about your physical health - it's real mental challenge. If you pass that challenge, your mind will be strong enough to get you through any challenge in your life. Shortly, it will save your time and your strength. And don't worry If you like to lift weights sometimes, your numbers won't drop. The new book is excellent -- the videos embedded within the text is a great feature. I find this combination superior to mere videos. The exercises are all one needs for strength and hypertrophy -- most importantly, they are safe. As always, look forward to future projects you have in store. Coach Steve Maxwell is a mentor since over a decade. His time-tested methods have helped me a lot since knowing him. Over five weeks now I work with the isometric exercises, he shows in his new book. And I am really enjoying them. Not during the exercises itself, but the benefits, I reap from them. I am doing a lot of road cycling and mountainbiking currently. Heavy barbell or kettlebell work would thrash me and would destroy my rides. But the isometrics with bodyweight are perfect in combination with it. I especially like the squat hold and the plank. I am looking forward to further results with this awesome and really underrated training approach.